Subscribe for James Lyle news! June 14-16, Heroes Convention, Charlotte, NC. The Southeast's Best Loved Comic Convention! TBA: YamaCon, Pigeon Forge, TN. James has been nominated for a Silver Reuben Award in the Advertising / Product Illustration category for his Creepy Nature program illustrated for Schiele Museum of Natural History in Gastonia, N. Carolina! 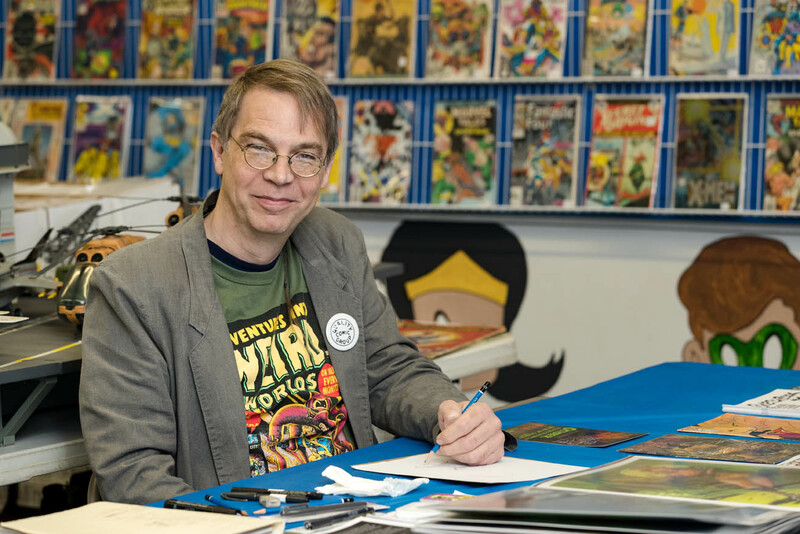 The National Cartoonists Society's Reuben Award honors the year's outstanding achievements in all walks of the profession. Winners will be announced May 18. 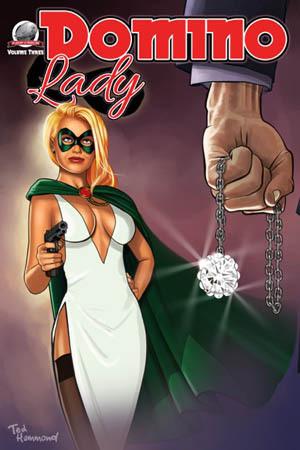 James provided the interior illustrations for Domino Lady Volume 3, now available in paperback and on Kindle, with this cover by Ted Hammond! 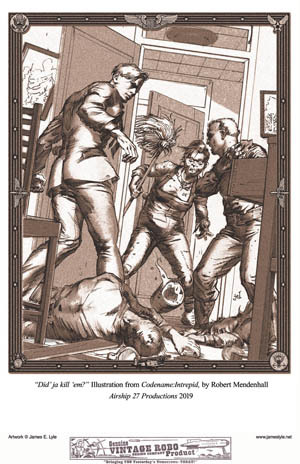 James' interior illustrations from the new book Codename: Intrepid are NOW for sale in the print shop! See them here. Codename: Intrepid, written by Robert J. Mendenhall, is now available on Amazon in Kindle and print editions! 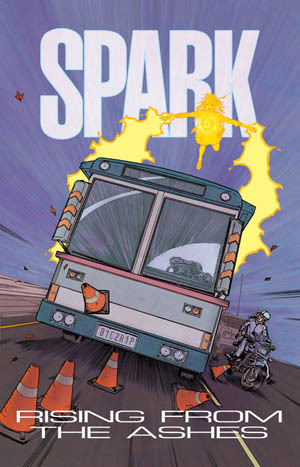 Spark: Caught in the ‘Net and Spark: Rising from the Ashes from Centerstone Group are free public service comics, distributed all over the nation, with pencils, colors, and lettering from James! It was created under grants from the U.S. Department of Health and Human Services, Office of Adolescent Health (Contents do not necessarily reflect the views of the DHHS or DAH). Read Spark: Caught in the ‘Net here! Read Spark: Rising from the Ashes here! Fill your walls with Lyle illustrations! Visit the new Prints for Sale section here. Above, James' promo piece for Marble City Comicon. 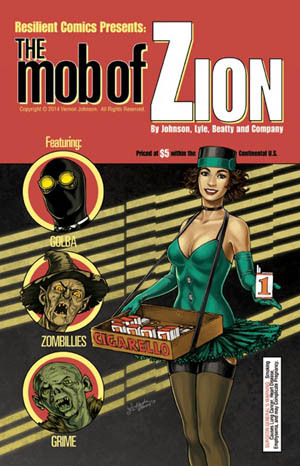 Mob of Zion is now available on Comixology! Dieselpunk at its best, as a group of vigilante gangsters with super powers bring justice to a city of crime and violence. My Dad Can’t Beat Up Your Dad (Phil Hwang), on Amazon here. Illustrator James Lyle: 30 Year Retrospective, September 27 through November 18, 2013, was at the Swain County Center for the Arts, 1415 Fontana Rd., Bryson City, North Carolina, with a display of James' artwork from the past 30 years. A Reception, Sunday, October 6, 2013 featured a free concert from Gypsy Bandwagon, 3:00 to 4:00 p.m.
October 25 through 27, 2013 the Southeast Chapter of the National Cartoonists Society Annual Meeting was in Knoxville, Tennessee. As chairman of that august group, James spoke about it with the media. James and Knoxville News cartoonist Charlie Daniel appeared on the local NBC affiliate (WBIR), on "Live At Five At Four." Friday morning, October 25, James and Charlie were guests on Star 102.1 (WWST) during the morning drive time, on the Marc and Kim Show. James and Shane Berryhill have a story called "Hail to the King" in "Hey, Kids! Superheroes!" a homage to kids comics of the past. To order visit GrayHaven Comics here! James and Michael Allan Leonard's DoorMan, a '90s comic book from Cult Press and Caliber Comics, is now online to read. 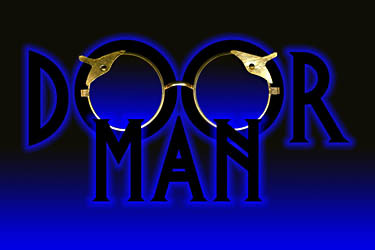 DoorMan is Janus de Nile, a time-traveller who can turn any doorway into a portal through space and time. Follow the story at http://doorman.smackjeeves.com/ It's also on drunkduck.com and comicfury.com. 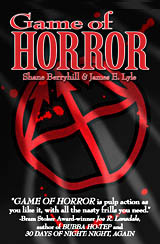 Chapter one of Shane Berryhill's Game of Horror, illustrated by James, is now on Facebook to read for free! Click here. James' character designs and prose pieces that tell some of the Game Of Horror backstore is now in a Game of Horror Extras Blog on Tumblr! Click here. James is illustrating book covers for Adventures of Chance Fortune young adult author Shane Berryhill. Click here to buy The Long Silent Night at Amazon. 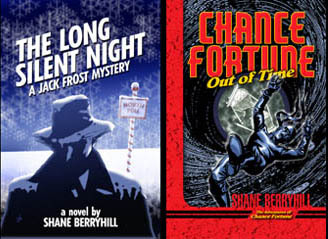 Have a look at James' book covers for Shane Berryhill in the Book and Magazine Illustration section. Copyright Shane Berryhill. James recently completed illustrations for the first chapter of "Game of Horror" with writer Shane Berryhill, of The Adventures of Chance Fortune young adults book series fame! "Game of Horror is pulp action as you like it, with all the nasty frills you need," praised Bram Stoker Award Winner Joe R. Lansdale. See some of the pages in the Comic Book and Graphic Novel section. Copyright Shane Berryhill. 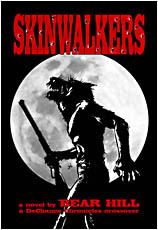 This ebook cover, illustrated by James, is for Skinwalkers by Bear Hill. To see more of James' cover work in the Book and Magazine Illustration section, click here. Skinwalkers copyright 2012. 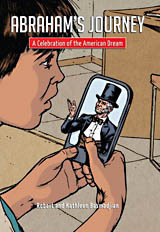 Abraham's Journey: A Celebration of the American Dream tells the story of a young boy, who through his faith, imagination and entrepreneurial spirit, sets out to achieve the American dream. This new book from Ambassador International features illustrations by James. Save $3.00 off the list price -- click here! 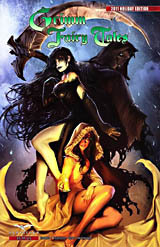 Seven pages of James' work appeared in Grimm Fairy Tales Holiday Edition 2011, from Zenescope Entertainment. 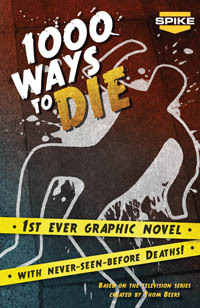 Zenescope Comics has released the "1000 Ways to Die" trade paperback. James drew two stories therein, "Green Gross-er" and "Myth Busted." Spike TV's "1000 Ways to Die," now entering its fourth season, showcases outrageous true stories about those who succumbed to the grim reaper in unorthodox ways. 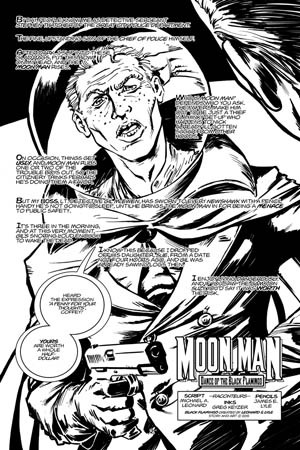 The series is Spike's first property to get the comic treatment. Look into it at zenescope.com. 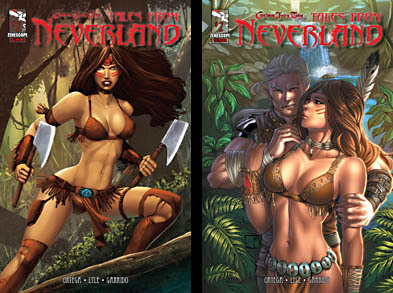 James penciled Tales From Neverland #2 for Zenescope Entertainment. Joshua Ortega wrote the tale of Princess Tiger Lilly, who fell under the spell of the mysterious stranger known as Pan. Look for the cover by Tim Seeley (left) or Nei Ruffino (right) at your local comic shop! James and Michael Woodring's graphic novel/web comic Dark Candle, set in 10th-century Bavaria, is on hiatus, but you can still see James' praiseworthy first pages at darkcandle.net. "As an accomplished illustrator, Lyle’s masterful use of close-ups, long shots and combinations give the storyline the dramatic graphics that lead the reader eagerly to the next page,” wrote Dennis the Menace illustrator Marcus Hamilton. "Dark Candle is an intriguing story combining an historic medieval setting with a timeless tale of romance. Lyle's art lends cinematic pacing to the story and captures the drama in such a way that the reader will feel immediately engaged with the characters. His expert draughtsmanship has the classic illustrative look that conveys the period with convincing detail," wrote three time Reuben Award winning illustrator Jack Pittman. James has a fun webcomic at thepluscomic.com. Check it out here! 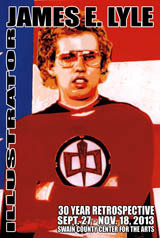 James will be at the Chickamauga, Georgia Public Library, 306 Cove Rd., Tuesday, June 15, 2010 from 3:30 on, with two programs of "Brainstorming a Superhero" and selling/signing artwork. James was interviewed for the 2010 edition of "Artist's and Graphic Designer's Market," an annual resource book for freelancers first published over 30 years ago. Among the market listings and industry contacts, insider advice and marketing ideas are a few, choice reviews of current artists. In 2008's edition James received recognition for his illustrations for Weekly Reader magazines. On Free Comic Book Day, May 1, 2010, James appeared at the Chattanooga-Hamilton County Bicentennial Library as a special guest, with a program on comic book art, career and a demonstration of technique. Visitors were encouraged to wear a costume, draw comics, check out books, graphic novels and manga, and bring something for the bring-one-take-one swap table. Info at www.lib.chattanooga.gov. James was selected to be a judge for the 2009 GameX Steampunk Art Competition, a one-of-a-kind science fiction/fantasy art contest designed to support and promote artists in the games, film and comic art communities. The competition was presented in conjunction with the GameX game consumer show and industry conference, October 23 through 25 in Philadelphia. Other judges included talent from companies such as Universal Pictures, DreamWorks Animation, Universal Studios, 2K Boston, Ubisoft and Turbine. Check out GameX at www.gamexpo.us. James' EGBA Custom Comic Book Invitation designs were praised as a "Cool Mom Pick" at the coolmompicks.com website and even made the "Geek Dad" Section of Wired online! Egba Originals custom comic book invites are created to order, using a custom-drawn image of the guest of honor and the theme of the event. They are even packaged in comic sleeves and envelopes like collector’s items. Check 'em out at egbaoriginals.com/comic.html. Sometimes a story is well worth waiting for. James drew "The Tragedy of Falstaff," featured in Negative Burn #21. 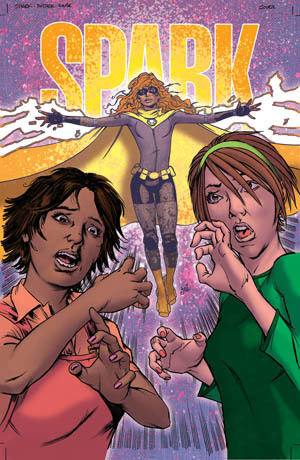 But the project was originally drawn for Caliber comics, a Saint Germaine story written by Gary Reed, who called James to finish it up, 10 years later, for Negative Burn. Caliber in its day, and Negative Burn now, are known for their mix of comic industry name talent and excellent newcomers. Negative Burn #21 can be found at your local or online comic shop. James is the Vice Chairman of the Southeast Chapter of the National Cartoonists Society, information at www.secncs.com. The National Cartoonists Society was born in March 1946, with Rube Goldberg as president, Russell Patterson as vice president, C.D. Russell as secretary and Milton Caniff as treasurer. The NCS now has chartered 16 regional chapters throughout the United States and one in Canada. NCS information is at reuben.org. James' work is now featured on the Ride the Dragon Game, based on the famous 318 curves in 11 miles at Deals Gap in the foothills of North Carolina and Tennessee. Collectible, pewter game pieces are moved along James' colorful dragon's tail illustration, avoiding the pitfalls of Fate cards. 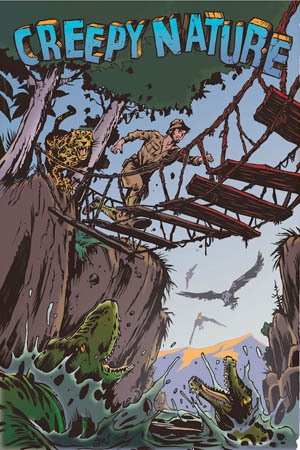 "Adam Among the Gods" was illustrated by James in 2008 for Aazurn Publishing, now in comic book shops and online at Aazurn.com. James' illustrations are featured in a new collection of Saint Germaine - Tales of an Immortal from Transfuzion Publishing. The collection was written by Gary Reed and James' work appears with artists Vince Locke, Andy Bennett, Tom Bionodillo and Guy Davis. The Asheville Citizen-Times ran a picture and article of James drawing with fourth and fifth graders at a local library event December 13, 2007. Above, James Lyle, photo courtesy Anthony Harden, photographer at ALT Media Pros.